Yesterday was very rainy here in the Portland Metro area. However, I had been indoors all weekend and needed to get out, regardless of the constant downpour. We visited Smith and Bybee Lakes in North Portland and enjoyed the totally abandoned trails. We got rained on very heavily, but the raindrops made for awesome macro photo subjects! According to my field guide, this mushroom is most likely a golden pholiota. But as always, because I am never 100% sure, I always err on the side of caution and use a "photograph and don't touch" rule. Wonderful shot! I love mushrooms. I've never seen a mushroom like this before, it's really pretty, and a great shot with the water drip. The droplets add such character! As if mushrooms needed more than they already have, lol. Great shot! As others, I love the water drops as well. Lovely shot. 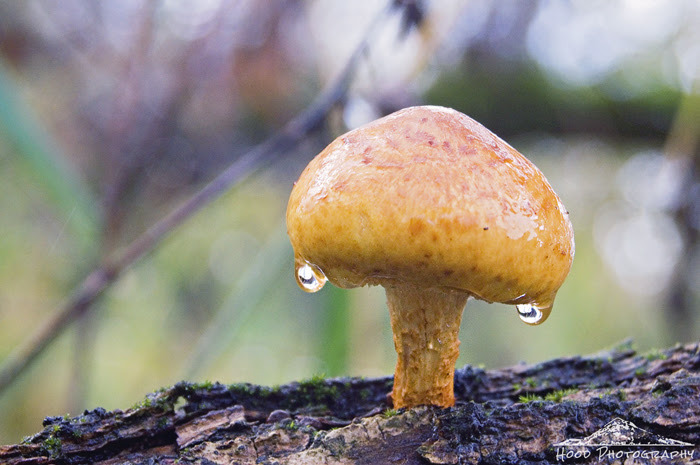 The suspended raindrops add a magical effect to this little mushroom.